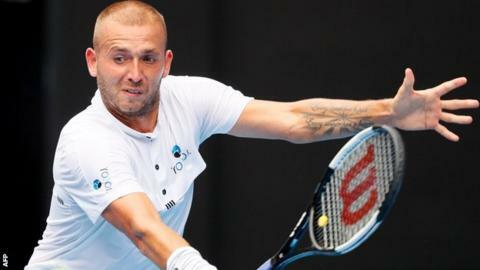 British number three Dan Evans is through to the last 16 of the Delray Beach Open in Florida after he beat defending champion Frances Tiafoe. Tiafoe served for the match at 6-5 in the second set, but Evans broke the American and won the tie-break 7-1. World number 148 Evans, 28, then lost serve at 5-4 up in the third, but eventually prevailed 3-6 7-6 (7-1) 7-5. Argentina's Juan Martin del Potro won his first match of the year as he returned from a fractured kneecap. The world number four, who missed last month's Australian Open, beat Japan's Yoshihito Nishioka 6-3 7-5. He will play American Reilly Opelka in the last 16, while qualifier Evans faces South African wildcard Lloyd Harris. American second seed John Isner beat Canadian Peter Polansky 6-3 7-6 (7-4) and faces unseeded Slovakian Lukas Lacko in the next round.